Founded in 1883 as the Bean Spray Pump Company in Los Gatos, California by chemist John Bean. The company's first product was a piston pump. Bean invented the pump to spray insecticide on the many fruit orchards in the area. A Bean sprayer was on display at the Forbes Mill museum in Los Gatos until its closure in 2014. Bean Avenue in downtown Los Gatos is named after John Bean. In 1928, Bean Spray Pump purchased two companies: the Anderson-Barngrover Co. and Sprague-Sells Co. The Anderson-Barngrover Co. manufactured a sealed can rotary pressure sterilizer and the Sprague-Sells Co. manufactured canning machinery. At this time the company changed its name to Food Machinery Corporation, and began using the initials FMC. LVT-1 exhibited by manufacturer (FMC) in 1941 parade, Lakeland, FL. FMC received a contract to design and build amphibious landing vehicles tracked vehicles for the United States War Department in 1941. FMC ranked 64th among United States corporations in the value of World War II military production contracts. In 1961, the U.S. Navy's Bureau of Ships issued bids for a high performance amphibious ship-to-shore cargo carrier capable of moving over water at 35 knots (approx. 40 mph) and over ground at the same speed. It had to carry five tons of cargo across water, through the surf, across the beach, and inland. The vehicle also had to be quickly loaded and unloaded under combat conditions. FMC's Ordnance Division in San José, California built and tested two prototypes named "LVHX2 Landing Vehicle, Hydrofoil" for the U.S. Marine Corps. These were the first amphibious landing vehicles to make use of hydrofoils for high speed ship-to-shore operation. Although the LVHX2 never went into production, the Marine Corps used the prototypes in their continuous research and development program to develop better equipment for amphibious assault operations. FMC later built the M113 Armored Personnel Carrier (APC), the Bradley Fighting Vehicle, and the XR311 at its former facility in Santa Clara, California. It also purchased the rights to manufacture some foreign military hardware, including the Brazilian EE-9 Cascavel, under license. 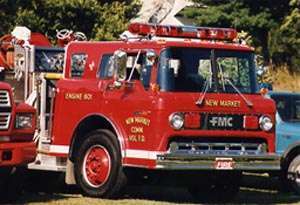 Bean also manufactured fire fighting equipment in the 1960s through the 1980s under the FMC and the Bean names. In 1972, personnel were transferred from ordnance to designing and building RVs (motorcoaches). The oil crisis and high prices led production to end after five years. 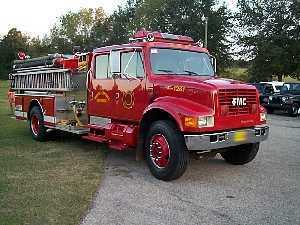 FMC also producedfire truck fire pumps and pumper bodies. It had an original equipment manufacturer (OEM) arrangement with Ladder Towers Inc. (LTI) to market aerial ladders. In the early 1980s the fire apparatus division of FMC tried to expand its role in aerial ladders on fire trucks, leveraging the Link-Belt crane division. FMC's expansion into production of aerial ladders failed: the FMC Fire Apparatus division was shut down in 1990. FMC sells chemical products used by beef and poultry processors to reduce pathogens, such a E. coli and salmonella, on uncooked beef and poultry. FMC obtained a patent on a method for sanitizing fowl that have been killed, plucked and eviscerated by contacting the fowl with an aqueous acid solution and maintaining that contact for a time sufficient to sanitize the fowl. In 1946, FMC bought Bolens Lawn and Garden Equipment. FMC changed its name again in 1948, becoming Food Machinery and Chemical Corporation. In 1961 the name was changed to FMC Corporation. In 1967, the FMC Corporation merged with the Link-Belt Company. The company produced FMC Link-Belt branded cranes and excavators. In 1986, the Link-Belt Construction Equipment Company was formed as a joint venture between FMC Corporation and Sumitomo Heavy Industries. 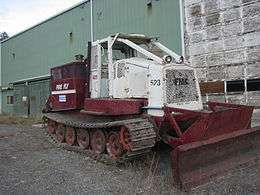 Between 1965 and 1985 FMC was the owner of the Gunderson metal works in Springfield, Oregon USA, during that period it was known as the 'Marine and Rail Equipment Division of FMC' (MRED), it was sold in 1985 to The Greenbrier Companies. In the 1980s, 1990s, and 2000s, FMC Corporation began spinning several of its divisions into separate companies, including United Defense and FMC Technologies, and selling its divisions, including its automotive division to Snap-on Equipment, a division of Snap-on, in 1996. Snap-on renamed the division the "John Bean Company". Bolens was sold to Troy-Built in 1988. In 2001, FMC spun off its energy, airport, and food equipment businesses into a separate company named FMC Technologies, Inc. In 2006 FMC Corporation celebrated 75 years being listed on the New York Stock Exchange. Pierre Brondeau was named President and Chief Executive Officer succeeding William G. Walter, effective January 1, 2010. Brondeau had been with Dow Chemical and prior to that Rohm & Haas. A former FMC site in San Jose, California is the location for Avaya Stadium, a new soccer stadium for the San Jose Earthquakes. In 2015, FMC completed the sale of its Alkali Chemicals business and acquisition of Cheminova, a multinational crop protection company, which aligns with the company’s corporate strategy to focus its portfolio on agriculture, health and nutrition end markets, and lithium technologies. FMC Corporation operated a phosphate mine and plant in Idaho on the Fort Hall Reservation of the federally recognized Shoshone-Bannock Tribes. 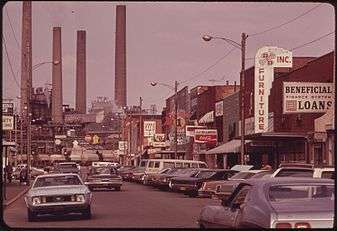 Between 1949 and 2001, it produced an estimated 250 million pounds of elemental phosphorus annually. In 1989, as part of what is termed the Eastern Michaud Flats Contamination, its 1500-acre plant site was designated by EPA under CERCLA as a Superfund site because of extensive water and land pollution caused by these operations. After working to improve operations and air quality, the company abandoned the plant and related mine about 2001 because of much higher electricity costs and the challenge of cheaper phosphate coming from China. Seventeen mines in the area have been designated as Superfund sites because of selenium poisoning. In 2009, CBS 60 Minutes ran an exposé on the use by farmers in Kenya of an FMC–produced pesticide, Furadan, as a poison to kill African lions. The piece suggested that Furadan was a serious threat to the future of the lion population in Africa. FMC has commented extensively on this issue through the media and their websites, including furadanfacts.com. They engaged with government officials, NGOs, and others to try and resolve the illegal use of pesticides to kill wildlife. The company took action to stop the sale of this product and instituted a buy-back program in East Africa when it determined that the illegal and intentional misuse of chemicals against wildlife could not be controlled by education or stewardship programs alone. The troubled development of the Bradley vehicle was satirized in the 1998 HBO movie The Pentagon Wars. In the movie FMC was fictionalized as A.O.C. corporation. "Gunderson, Inc.". 9 April 2006. Retrieved 21 August 2010. Kathy Hinson (ed. ), Gunderson; A History of an Oregon Company (Portland, OR: Gunderson, 2000). 1 2 3 4 5 6 7 8 "FMC CORP 2013 Annual Report Form (10-K)" (XBRL). United States Securities and Exchange Commission. February 18, 2014. 1 2 "FMC CORP 2014 Q1 Quarterly Report Form (10-Q)" (XBRL). United States Securities and Exchange Commission. May 7, 2014. ↑ "FMC Corporation Announces New CFO, Appointment of New Business Group Presidents". Retrieved 18 September 2012. ↑ "Los Gatos city ordinance honoring the history of the Almond Grove neighborhood" (PDF). losgatosca.gov. ↑ "Anderson-Barngrover Cont. Rotary Pressure Sterilizer". the American Society of Mechanical Engineers ASME.org. Retrieved 4 May 2014. ↑ E.M. Lundquist; Bruce Harmon; Kathy Hinson (February 2000). "Gunderson : A history of an Oregon company" (PDF). gbrx.com. Gunderson, The Greenbrier Companies. ↑ "Troy-Bilt Historical Review". The PressureWashr Review. Retrieved 23 March 2015. ↑ "FMC Corporation - Investor Relations - FMC Corporation Names Pierre Brondeau President and Chief Executive Officer". ↑ "FMC Corporation - Investor Relations - FMC Corporation Completes Sale of Alkali Chemicals to Tronox". ↑ "FMC Corporation - Investor Relations - FMC Corporation Completes Acquisition of Cheminova A/S". ↑ "Poison Takes Toll On Africa's Lions". CBS News. 2009-03-26. ↑ "Furadan Facts > Home". ↑ "Pa. pesticide maker vows steps to protect lions". USA Today. 2009-03-29. Wikimedia Commons has media related to FMC Corporation.